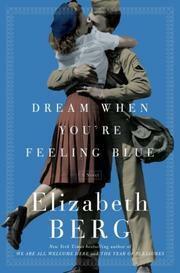 A Chicago trio maintains long-distance romances with their WWII soldiers. Berg’s latest (The Handmaid and the Carpenter, 2006, etc.) centers on a lively family in the Midwest. The large, God-fearing and Communist-hating Heaney brood consists of doting but strict parents, three beautiful daughters and three spunky sons. The Heaney family tries to do its part for the war effort: The young ones collect scrap metal, the older ones work in factories. Berg does a fine job of capturing the lives of American civilians during the war—there are references to everything from FDR’s “Fireside Chats” to Ladies Home Journal rationing recipes. The bulk of the story centers on the three Heaney girls as they transition into adulthood. Reminiscent of the beloved girls from Little Women, the Heaney sisters (Louise, Kitty and Tish) are passionate, headstrong and for the most part admirable—though they each have moments of self-absorption and carelessness. Their spare time is devoted to writing letters to their far-off loves, and this is where Berg focuses her efforts. The sisters’ barrage of mundane letters is for the most part tiresome. A few tear-stained epistles would have done the trick, but Berg takes it too far. An overwrought and monotonous depiction of life in Middle America during WWII.